Lettuce can be downright boring all by itself, but with a bit of imagination, it can be transformed into something not just delicious, but truly decadent. 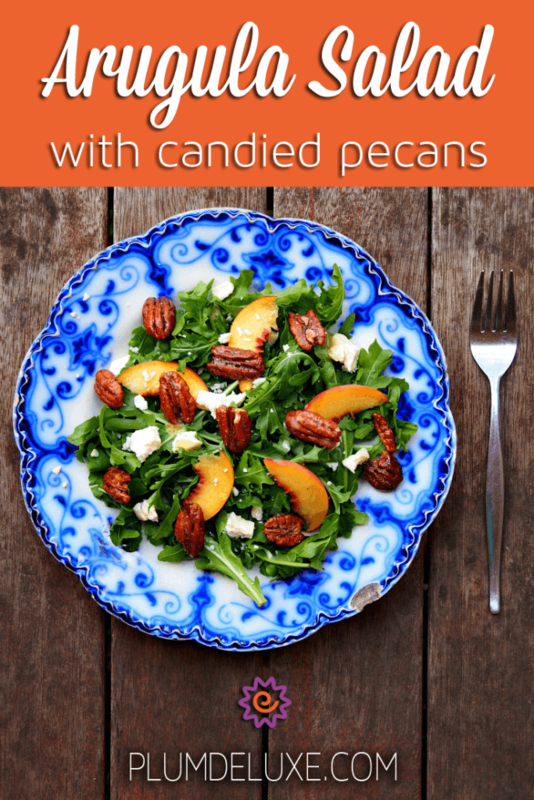 This recipe for arugula salad with candied pecans is one way to launch a plain old salad from simple to divine. 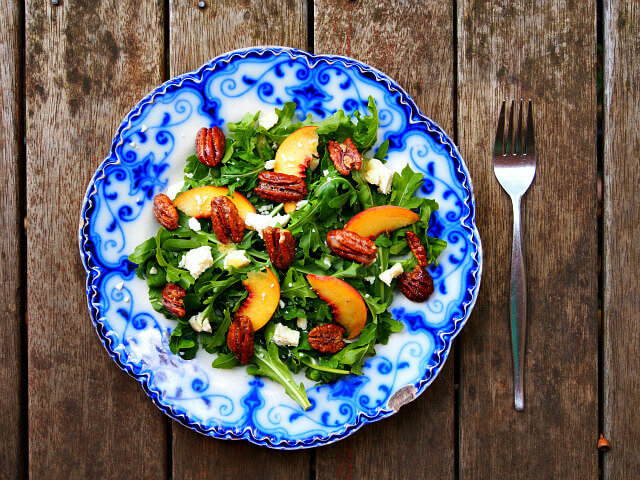 Any lettuce can be made delectable with toppings, but arugula is extra special with its beautifully shaped leaves, tender crunch, and slightly peppery flavor that pairs well with the sweetness of the candied pecans, peaches, and salty feta cheese. It’s also healthy with its high levels of folic acid and abundance of antioxidants such as vitamin K, vitamin A, and vitamin C, and it’s packed with carotenoids and minerals like manganese, iron, potassium, and calcium. Choose fresh, bright green leaves, and give them a good wash to remove any traces of sand or dirt. Arugula pairs so well with a variety of flavors, so I like to add toppings that are diverse in texture and flavor. Crunchy candied pecans are wonderful all by themselves, but when tossed with creamy feta or goat’s cheese and tender slices of ripe, fragrant peaches, they are sublime. The earthy richness of pecans is gorgeous when candied with a rich, brown sugar glaze with a hint of spice. You can toast the pecans in a frying pan then toss with the glaze for quick candied pecans, or take the time to roast them slowly for added depth of flavor. The glaze is simplicity itself, just brown sugar with water and spiced with a sprinkling of cinnamon, cumin, or cayenne pepper if you like a bit of heat with your sweet. They’re also lovely mixed with a generous drizzle of vanilla extract instead of the water, and the fragrance while they roast is intoxicating. If you’re pan-toasting the pecans, just toss them with the glaze when toasted and set aside to cool. If you’re roasting the pecans, toss them with an egg white beaten until frothy with a bit of water, then add the glaze and roast on low heat for about an hour. Just be sure to check them every 15 minutes, and give them a stir so the nuts don’t get burned or scorched. In small bowl, mix together brown sugar, salt, and spice (if using). Set aside. In medium bowl, whisk together egg white and water until white and frothy. Set aside. In large bowl, place pecans. Pour in egg white mixture and stir to coat. Add brown sugar mixture and stir to coat. Pour coated nuts in single layer on baking sheet covered with baking paper. Remove from oven, and let cool before serving. This salad is lovely with many varieties of fresh or dried fruit. This time I used fresh yellow peaches, sliced thinly, but it’s also good with dried or fresh apricots, nectarines, cherries, mango, or dried, sweetened cranberries. Fresh, creamy goat’s cheese is marvelous in this salad, but if you don’t have any on hand, crumbles of feta cheese work beautifully, too. Wide shavings of parmesan cheese are also lovely, but I prefer the creamy nuggets of a soft cheese. 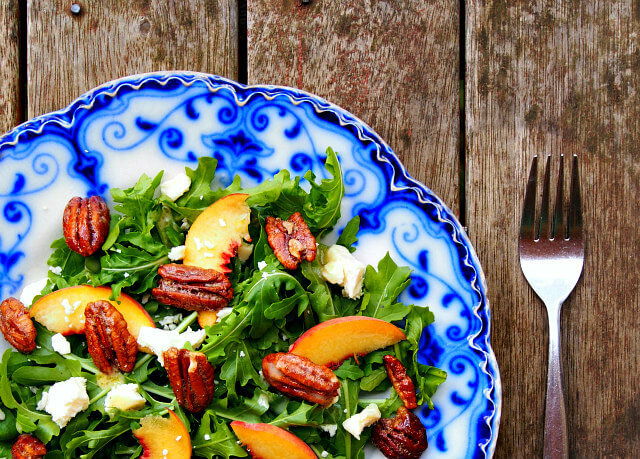 I like a sweet, sour dressing for this arugula salad with candied pecans, whisking together citrus juice, olive oil, salt, pepper, mustard, and honey. Top the arugula with the nuts, cheese, and fruit, then drizzle with the dressing and serve immediately. I really enjoy this salad paired with the nuttiness of the maple and almond Pick Me Up oolong tea or, for a caffeine-free option, the zingy Rejuvenation ginger-lemon herbal blend. Combine all ingredients in small bowl and whisk to emulsify. Set out four plates, and place one large handful of arugula on each plate. Divide goat’s cheese, peach slices, and candied pecans equally between each plate, then drizzle with Honey Citrus Dressing. Want more arugula? Try our Autumn Arugula Salad or some bacon-wrapped grilled pears served on a bed of arugula.